Outside my window... still dark, but foggy - which usually means a sunny day is coming! Pondering... twice in a row now, we were literally a minute or two from walking out the door on our way to church when Wyatt and Tate were called out on a Search and Rescue - this time a missing hunter. They really hated to miss church, but when duty calls... Other teams had been searching through the night and needed to be relieved. Fortunately, by the time they got up to the search base, the hunter had been found and they were able to turn around and come home. Thankful... for our friendly church family, for a fun weekend with my friend Karen, for crisp, sunny fall days (perfect! ), and for a few more items crossed off the Mother Load (always a good feeling). Creating... seeking inspiration for Christmas gifts. Going... for a walk with Gunnar. Reading... Theras and His Town with Gunnar, and Indian Captive: The Story of Mary Jemison with Tate. In the kitchen... oh, the pressure! It's not even six-thirty in the morning yet and I'm supposed to have dinner started? Sometimes I'm envious of those people that have their whole week's menu planned out ahead of time, but I usually don't. I'm flying by the seat of my pants, here. Actually, once I get the boys to help me inventory the big freezer and cab-zilla (see The Mother Load...) I'll have a better idea. But Wyatt and I have rehearsal tonight, so we won't all be together for dinner, reducing my motivation to make a "real" dinner. Maybe lunch? In the learning rooms... ancient Greece, the colonial era of America, graphing linear functions, transitive verbs, experiments with liquids and density, and the Constitution. The Mother Load... yes, the rumors are true, I got the kitchen floor scrubbed and waxed. It's funny how I don't notice it growing dull over time, but seeing it clean and shiny is such a wonderful transformation. The boys helped with some of this over the weekend. Yay, boys! Noticing that... days are getting shorter. The basic law of prayer is that we receive not the answer which we desire, but the answer which God in His wisdom and His love knows to be best. Most of our prayers are prayers for escape. We pray to be saved from some trial, some sorrow, some disappointment, some hurting and difficult situation. And always God's answer is the offer not of escape, but of victory. One of my favorite things... this time of year! My brother, in his crib. 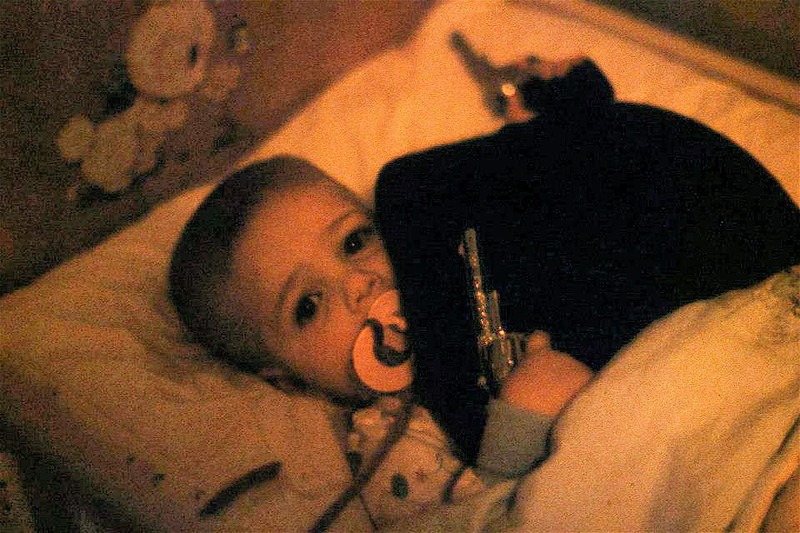 I mean, doesn't everyone sleep with their binky, their black hat, and their pistols? Needed the quote. Love the photo! Wow! and another impressive list with so much accomplished! for the Shiny Kitchen Floor! Still wondering how y'all came to name your food storage 'cab-zilla' -- really BIG cabinet? in honor of Godzilla? Oh that's a gorgeous photo!! Nathan used to take his toy motorbikes to bed with him, and would clutch them tightly in his fists. so cute! Yep - Cab-zilla is a floor-to-ceiling (and deep) cabinet. Big, like Godzilla. Kerry named it that. And yah, I love that photo. The combo of binky and pistols just cracks me up. That is a great picture! I will be praying for work for Kerry! Some weeks I have a plan for dinner, but recently I have not done so well. But no one ever goes hungry! :) Wow! That mother load wears me out! Oh how I have missed you! I love your every day life! Just popping by to say hello and I'll be reading back in time until I am fully caught up! Hey, We live in Mary Jemison territory! Great story. Her grave is just a short distance from our house. I'm laughing so hard at that picture! Love it! Sounds like we're almost together in school. We just finished Theras and His Town last week.